This is a fantastic way to use up leftover vegetables and anything else that's going out of date. This versatility is what I really love about this dish. Bring a large pot of salted water to the boil. Snap the woody ends off the asparagus spears and discard, then chop the spears. When the water boils, add the asparagus and cook for 3 to 4 minutes to blanch it. Scoop out the asparagus with a slotted spoon and set aside. Add the pasta to the boiling water and cook according to the packet instructions, until al dente. Drain the pasta and rinse it under the cold tap to stop it from cooking further. 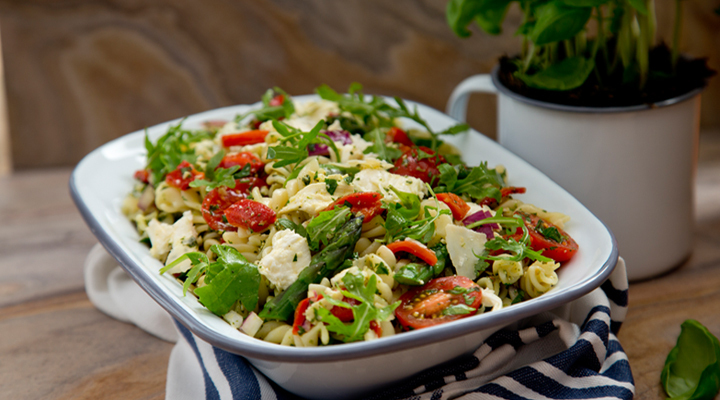 Place the pasta in a big salad bowl and stir in the pesto until the pasta is evenly coated. Add all the remaining ingredients, season with a pinch of salt and pepper and toss to combine. If the pasta salad looks a little dry, add a teaspoon of extra virgin olive oil.